Warm spring weather might be on the horizon in Toronto, but for now, it still feels very much like winter outside. It should come as no surprise then that the Weather Network confirmed April as the snowiest month of this cold weather season. We've seen 20.3 centimetres of snow so far this month - that's more than double the amount we got in December 2015 (3.2 centimetres) and January 2016 (10.6 centimetres) combined. 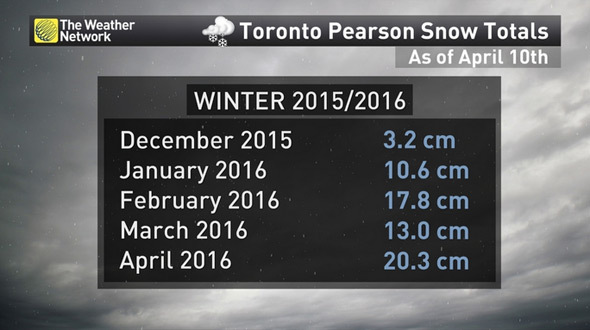 Back in 1979, Toronto saw a whopping 25.8 centimetres of snow accumulate during the month of April. Though we're about centimetres away from beating that record, let's hope history doesn't repeat itself. Photo by verok26 on Instagram.